Saturday tickets for this summer’s Royal International Air Tattoo are set to sell out by the end of April, predict airshow organisers. Tickets for all the enclosures have already sold out for Saturday, July 8, and admission tickets are set to follow as the Air Tattoo’s Earlybird offer comes to an end on Bank Holiday Monday (May 2). 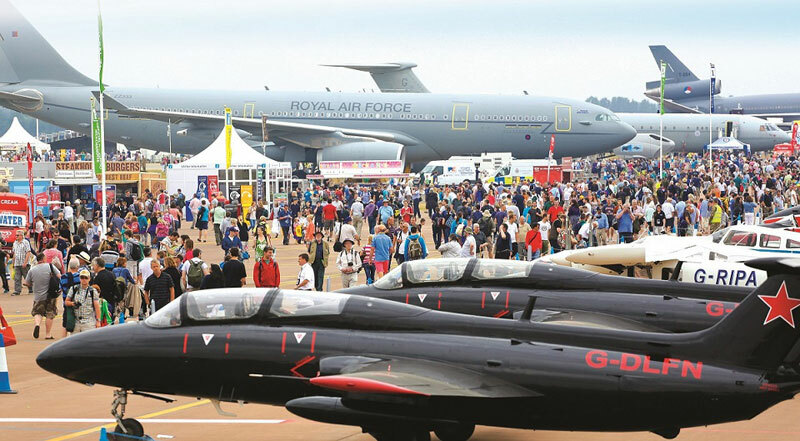 Highlights such as the first ever international display by the world’s most advanced jet – the F-35B Lightning II – and the Red Arrows are fuelling an unprecedented demand for tickets for the airshow, which takes place on July 8-10 at RAF Fairford in the Cotswolds. In addition to an eight-hour flying display, visitors will be able to view a wide range of aircraft in the Showground and enjoy a feast of fun-packed interactive activities for the whole family including the Techno Zone, Adrenalin Zone, Vintage Village and Autodrome. The Air Tattoo is staged annually in support of the RAF Charitable Trust. Tickets for the event are only available in advance. Specially-priced Earlybird tickets are available until May 2 from www.airtattoo.com or by calling 0800 107 1940. All accompanied under-16s go free. Free parking. The UK display debut of aerobatic team KrilaOluje at RAF Fairford in the Cotswolds this summer will see Croatia become the 56th nation to take part in the Royal International Air Tattoo since it was established in 1971. 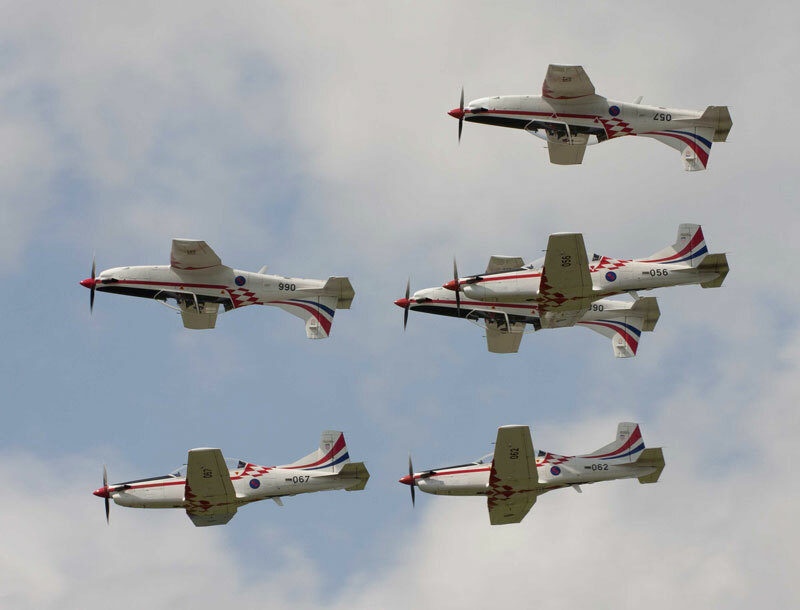 KrilaOlujefly six Swiss-built PC-9M turboprop aircraft and are renowned for performing attractive and imaginative display sequences including dynamic close-formation, opposition and solo elements. Its pilots and aircraft are drawn from the ranks of the 93rd Air Base at Zemunik near Zadar on the Adriatic coast. Since its first public appearance in 2004, Croatia’s national aerobatic team, whose name translates as Wings of Storm, has displayed around the world but it has never before appeared in the UK. The name KrilaOluje salutes a major Croatian military operation named ‘Oluje’ (Storm), which took place in August 1995 during the country’s war of independence from the former Yugoslavia. It was the climax of that campaign and a major event in the wider Balkan conflict of that era. Another treat for visitors to RIAT 2016 comes in the form of the KrilaOluje support aircraft, a Mil Mi-171 transport helicopter, which will be on static display. May Bank Holiday weekend (Saturday 28 and Sunday 29 May) will see the American Air Show at IWM Duxford, celebrating the reopening of the newly-transformed American Air Museum . Over the weekend, vibrant flying displays will be accompanied by evocative living history, veterans’ voices and powerful film and music to show the developing relationship between Britain and America through the World Wars, Cold War and into the present day. In addition to the dynamic flying display, visitors will be able to meet living history groups representing the United States Air Force in the Second World War and during the Vietnam era, listen to nostalgic music performed by Miss Holliday Swing, The Bluebird Belles and Pete Wayre and explore the newly-transformed American Air Museum, containing the best collection of American aircraft on display outside North America. • Epic flying displays depicting the bomber operations of the Second World War, the war in the Pacific and the Vietnam War. • Thrilling contemporary displays by the Patrouille de France (Saturday only), the Red Arrows (Sunday only) and the Eurofighter Typhoon. • Two replica Royal Aircraft Factory SE5a biplanes and a replica Nieuport 17, representing the relationship created between Britain and America during the latter stages of the First World War. • Four North American Harvards, key training aircraft for British and American pilots, take to the skies to represent the British-American alliance reinforced while America remained neutral in the Second World War. The Harvards are followed by a Spartan Executive and a Ryan STA, glorious 1930s aircraft that were also used for training purposes. • Archive sound and film footage places visitors on an Eighth Air Force bomber airfield in the Second World War as the ground crew await the arrival of the last B-17 Flying Fortress to return from a mission. B-17 Flying Fortress Sally B flies in, accompanied by two P-51 Mustangs and a TF-51 Mustang, the fighter aircraft that accompanied the huge bombers for part of their mission. Following a poignant display by B-17 Flying Fortress Sally B, the Mustangs are intercepted by a Hispano Buchón (Messerschmitt Bf 109) and a thrilling tail chase ensues. • As two Douglas C-47 Skytrain aircraft fly in, large screens are filled with footage of American paratroopers and, in a filmed interview, Henry ‘Duke’ Boswell, a paratrooper in the Second World War, describes his experiences as a young man carrying out combat jumps, including on D-Day, 6 June 1944. The two C-47 aircraft are followed by a de Havilland Dragon Rapide and a Piper L-4 Club. • Demonstrating the war against Japan in the Pacific, a North American B-25 Mitchell, Mitsubishi A6M Zero Replica, Curtiss P-40 Warhawk, Grumman FM-2 Wildcat and Goodyear FG-1D Corsair, take to the skies accompanied by archive film footage of the Doolittle raid. • In commemoration of the decade-long Vietnam War two North American T-28 Fennecs take to the skies to the unmistakable sound of Jimi Hendrix. Bell UH-1 Iroquois (‘Huey’) and Hughes OH-6 Cayuse (‘Loach’) helicopters fly through accompanied by the dramatic Ride of the Valkyries by Wagner. The Vietnam display concludes with a display by a North American OV-10 Bronco and a Shorts SC-7 Skyvan to the rousing music of The Doors. The story of British and American collaboration in conflict concludes with an exploration of modern warfare and the causes of conflict in the Gulf, Afghanistan and Iraq. 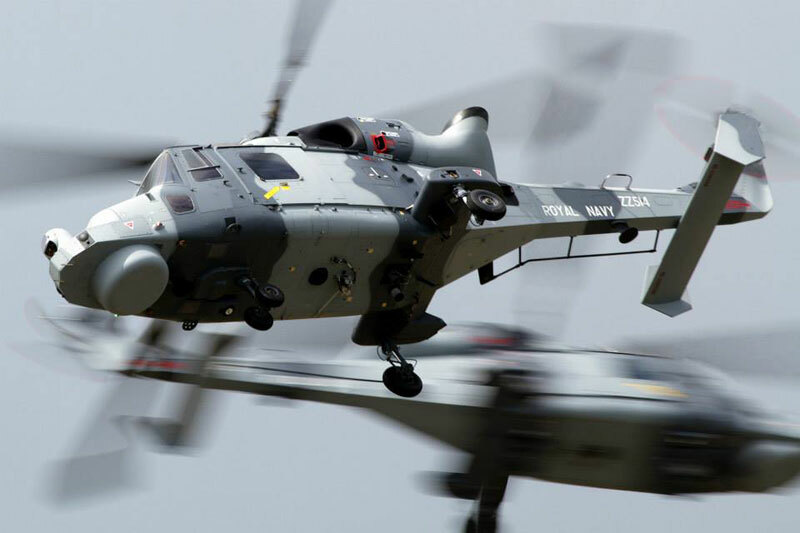 Wings & Wheels are thrilled to confirm the dynamic Royal Navy Black Cat four-man helicopter display team will be delighting audiences on Saturday 27th and Sunday 28th August in their front-line Lynx maritime attack helicopters. Not seen at Dunsfold Aerodrome since 2013, the Lynx is the backbone of the Fleet Air Arm and front-line operations by the frigate and destroyer fleets. Operating over the ice of Antarctica and the sands of the Gulf, the expanse of the Indian and Atlantic Oceans and the confines of the Strait of Gibraltar or English Channel, the Lynx truly is a jack of all trades. The fearsome helicopter is capable of taking on enemy ships (with Sea Skua missiles), enemy submarines (with Sting Ray torpedoes or depth charges), and smaller surface targets courtesy of machine-gun pods or sniper rifles. The aircrew and engineers are all volunteers from 702 Naval Air Squadron and the Lynx Wildcat Maritime Force based at the Royal Naval Air Station Yeovilton in Somerset. The name ‘Black Cats’ is derived from the fierce cat depicted on the 702 Naval Air Squadron emblem and the term ‘blackcatting’ which is naval slang for one-upmanship – doing or owning something better than someone else. The Royal Navy won’t just be displaying their prowess in the air but also in the static ‘Wings Zone’ with a Royal Navy Merlin Helicopter and Royal Navy Hawk on show. The Royal Navy Mobile Recruiting Van (MRV) manned by Royal Marines will also be demonstrating team building activities in the arena and will be on hand to answer any questions. Wings & Wheels has an all-star line-up of RAF display teams this year. The Red Arrows, Typhoon, King Air and Battle of Britain Memorial Flight (BBMF) (Spitfire, Hurricane, Dakota) will all be displaying at Dunsfold Aerodrome on both days, Saturday 27th and Sunday 28th August 2016 as well as the Attack Helicopter Display Team from the Army. More aviation displays will be announced in May. The major repaint of Avro Shackleton WR977 is now underway at Newark Air Museum. 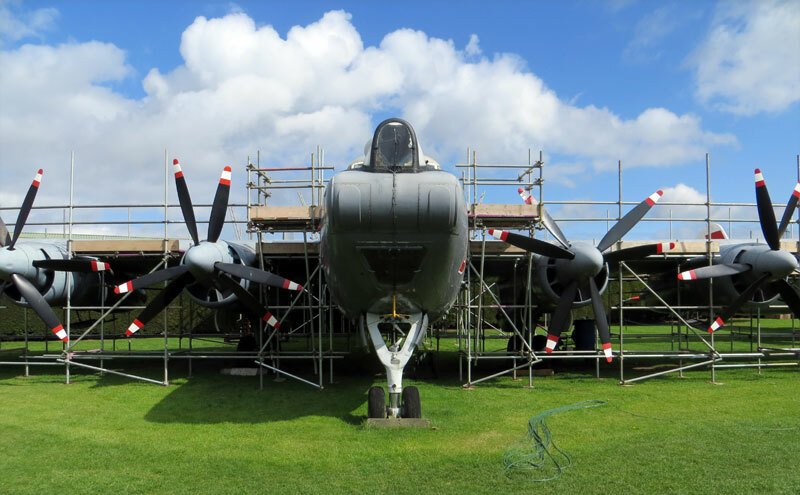 Scaffolding started to be erected around the whole of the sixty (60) year old aircraft on Monday 4th April and the scaffold installation was completed and officially handed over to the museum on Thursday 7th April. Some initial pressure washing work was undertaken on the airframe on Friday 8th April. After a short induction session on Saturday 9th April from the museum’s Restoration Manager the first restoration team went on to the airframe later that day. In reasonably benign weather conditions some excellent progress was made by nine members of the newly established WR977 Painting Team, who travelled to the museum from around the UK. This project will involve cleaning, de-corrosion and repainting work and will be carried out with major support of the aircraft’s owners, the Lincolnshire’s Lancaster Association. First Thunder Day of Season a Great Success! Over the past few years, as some of the propeller driven aircraft within the Yorkshire Air Museum’s collection have been brought into ‘live’, engine running condition, we have refined the “Thunder Day” concept into a very popular event, enjoyed by hundred’s of people. The show featured engine runs of two of the Museum’s WWI bi-planes, in the form of the Port Victoria Eastchuch Kitten and Royal Aircraft Factory SE5a; the imposing WWII Douglas Dakota; post war 1947 De Havilland Devon VIP Transport (known to have carried Lord Mountbatten) and the Cold War jets of the BAE Nimrod MR2 XV250 and the mighty Handley Page Victor V-Bomber XL231 “Lusty Lindy”. The Museum’s volunteer Fire Team, trained to meet Civil Aviation Authority standards, provided much entertainment for visitors from the start, with children having fun with the fire hoses and culmination with a simulated aircraft rescue activity, using the mighty 38 ton Reynolds Boughton Chubb Pathfinder airport fire tender and six-wheel Range Rover rapid intervention vehicle to spectacular effect. 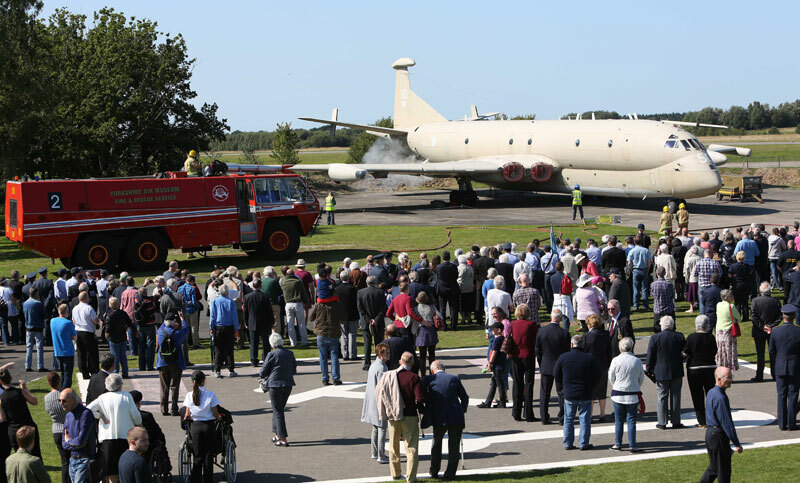 The next of these exciting events takes place on Sunday 5th of June, and it is planned that the Museum’s live Blackburn Buccaneer XN974 will be taking part once again, after a complete repaint into the striking Fleet Air Arm colours it originally bore. This aircraft performs an impressive display with all its control surface movements and wing-folding routine as it would on board an aircraft carrier. The Royal Air Force Museum have announced an exciting new campaign which offers members of the public the opportunity to have their name written on the wings of an RAF Red Arrows Hawk Jet that will fly throughout the Red Arrows’ 2017 display season. Squadron Leader David Montenegro, Red 1 and Team Leader of the Royal Air Force Aerobatic Team, the Red Arrows, said: “Through the Names on a Plane campaign, thousands of people will be joining us as the Red Arrows fly in 2017, displaying to millions of people. “On each of these occasions, the team aims to showcase the excellence of the Royal Air Force and, as we approach the Centenary of the Service in 2018, we are especially delighted to be supporting the RAF Museum. “The Museum’s Centenary Programme will transform its London site, providing an enduring legacy for the Royal Air Force.